Combine with the MS1 Sling and Paraclip™ to provide two to one-point convertibility. Manganese-phosphate finished steel and reinforced polymer hardware with custom snag-free high durability 1-1/4″ webbing. 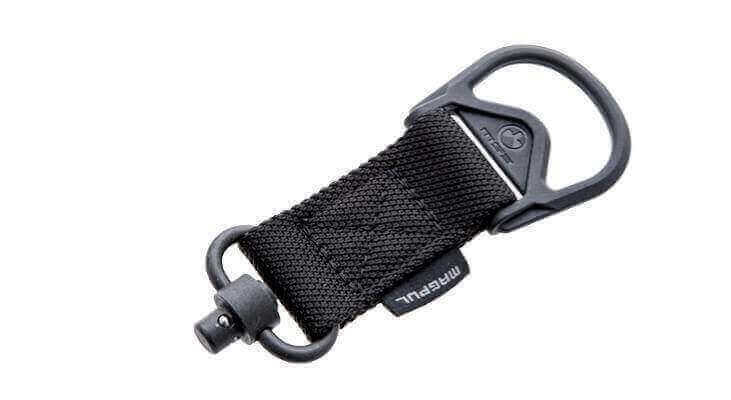 Made in U.S.A.
FRONT – Using optional Paraclip™, compatible with the Magpul RSA®, MSA®, and Forward Sling Mounts, as well as many snap-hook style sling loops* and standard or QD sling swivels for use in two-point mode. * Snap-hook style sling loops with an inner diameter of at least 3/8″ are required, but 9/16″ and larger will provide full range of motion of the Paraclip™.